The end of this session marks an opportune time for me to bring to a close my service to the people of Ottawa South as their member of provincial parliament. "Idealism?" wrote Martin Regg Cohn, provincial politics writer for the Toronto Star. "This is the point at which we could be saying generous things about Dalton McGuinty" began the column from the Globe and Mail's Ontario politics columnist Adam Radwanski. Well maybe ... if it's warranted by his performance measured against his promised performance. Dalton McGuinty came to power in 2003. He'd lost his first election leading the Liberal party (as most first-time leaders do) to an incumbent Premier, but in 2003 Mike Harris had retired and Ernie Eves had been hurt by, amongst other issues, electricity costs. During the provincial election of 1971, when I was a teenager, over 73% of eligible voters went to the polls. By the 1999 election, the turnout among eligible voters was little over 50%. When barely half our population takes the time to exercise their most basic democratic right, when turnout among young people and new Canadians hardly hits one-third, real change is needed. People have lost faith in their politicians and their institutions of government. Disturbing as it is, it is not hard to understand why. For decades we have watched our democratic institutions erode. And for the last eight years we have seen these trends accelerate dramatically under the Harris-Eves government. The 2013 revision would read "under the McGuinty-Wynne government." Voter turnout has declined rapidly in Ontario since Bob Rae's unlikely victory in 1991, including a drop of 10% since the election of 1999. Shortly after McGuinty's 3rd successive electoral victory as leader, I noted McGuinty had won despite achieving "the lowest share of electors who chose the Liberal party since WW II." "Government Budget Balances and Net Debt"
"The Harris-Eves government added $21 billion to the debt and was the second last government in Canada to balance their budget. We will comply with the Taxpayer Protection Act and balanced budget legislation, not bend the law at whim." 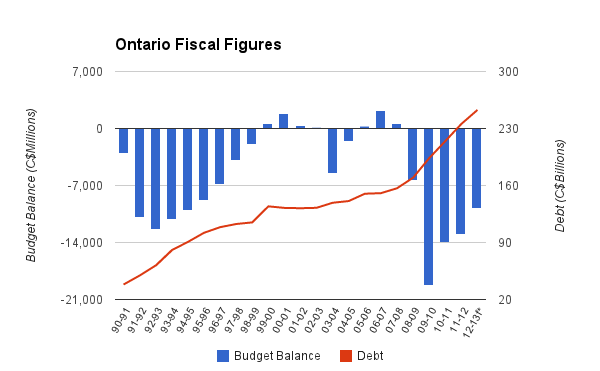 There were years, early on, when the McGuinty government showed a budget surplus, but there were no years where a reduction in total net debt was accomplished. The columns written by Mr. Regg Cohn and Mr. Radwanski are full of misplaced praise, despite their feigned criticism. ...he oversaw improvements to the education system, began the arduous task of making health-care spending sustainable, made long overdue investments in crumbling infrastructure and boldly undertook tax reforms that he thought would improve competitiveness. Stacked up against his environmental and educational legacies, his liabilities will fade one day. ...in the rush to judgment, he is a much condemned man. The only consolation is that history will probably be kinder to him ... He reduced class sizes and expanded university enrollment; balanced the budget and then primed the pump for the 2008 economic crisis; weaned us off coal-fired power plants and preserved the greenbelt. I'm not at all certain the 81% of Ontarians that could have voted for Mr. McGuinty's party in 2011, but didn't, would agree with much of these assessments. He spent a lot of borrowed money and a lot of it went to education - but more bums in more chairs doesn't necessarily equate to a better education; just more credentialed bums. The tax changes, which included harmonizing with provincial sales tax with the federal goods and services tax, did promise to increase competitiveness - but the Globe and Mail's political staff didn't seem to notice as those changes were diminished in negotiations with the NDP once the Liberals were reduced to a strong minority government. The gas plant debacle is, no doubt, about different things to different people. To some, it's about losses of over $500 million - but if people understand the accounting reducing the cost to that level, they understand unnecessary non-cancelled power plants will cost several billions before either the Mississauga gas plant is built (100's of kilometers away in Lambton), or the Oakville generation station is built (100's of kilometers away in Bath). If people understand the deleted documents, they understand public servants have not deleted documents, but the political staff has brashly done so. Martin Regg Cohn writes that "McGuinty's victories were partly dumb luck." In his statement of resignation, Dalton McGuinty thanked his "Queen's Park family" including the Queen's Park Press Gallery. It was probably some of both dumb luck and his "Queen's Park" family that kept him in power for so long. On the day he resigned his seat, the most appropriate commentary on the accomplishments of Premier McGuinty probably came not from natural gas generation stations, but from the coal-fired plants his 2003 election platform promised to close by 2007. Other parties promised 2015, but righteous Dalton felt 2007 was doable. Coal generators had their most productive day in months as McGuinty resigned - with his idealism intact. no рοіnt doing the ѕamе thіng agaіn. Hi there to every one, it's genuinely a pleasant for me to visit this website, it includes useful Information.